With the temperatures unseasonably mild this afternoon, I took advantage of the opportunity to get out and get some fresh air and do a little fishing and exploring on a small wild trout stream. I was a bit surprised to see the water temperature holding at 40, despite some snow melt this week. The sun was out, it's light playfully reflecting off the riffles of this little gem of a stream. 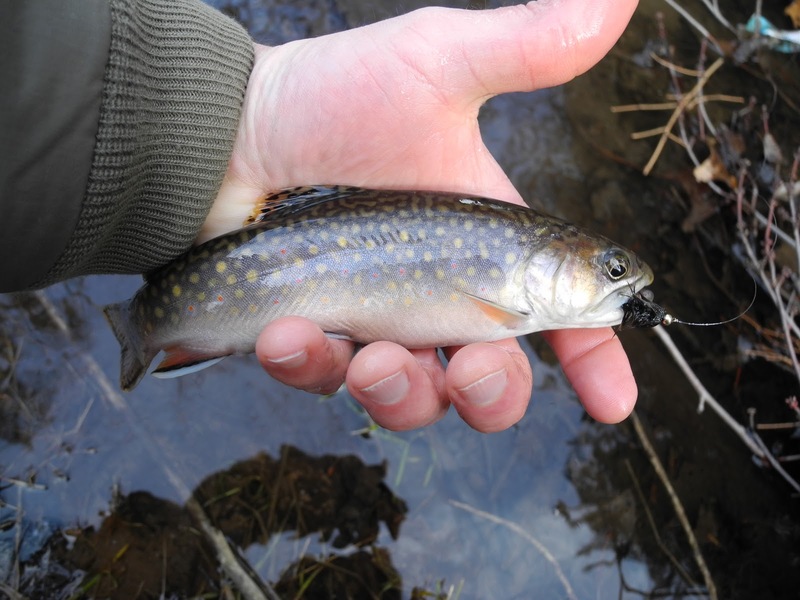 The year began as 2011 ended with the first fish being a brook trout, a particular favorite of mine. As I continued to explore a section of the stream I had not fished before, I had a few bumps and short strikes. I was hoping to find a tiger trout as this stream is known to have and few and sure enough in a deeper slower run a savage strike was followed by holding my first tiger trout. I finished up the day with a pretty little brown and decided head back to the car. What a great way to kick of 2012 ! When I think of winter, I think of juncos in the snow ! This morning the snow is coming down and there's no place I have to be and no long list of things that need to be done. It's been a very long time since I could say that ! This morning I am just enjoying the junco's flittering about the feeders and drinking some coffee as a gift from a gracious God who provides seasons of work and rest. Just a quick post for a knot that I now use almost exclusively for attaching the fly to leader. The Davy knot was invented by Davy Wotton. I used to use an improved cinch knot until I started using this knot. It is quick to tie and strong but what I like most about it is that there is very little waste, meaning you can change your fly many times without having to tie in a new tippet. I highly recommend this knot except when using a fluorocarbon tippet as I have had this knot pull out with fluorocarbon (I think it is due to the lower friction generated when fluorocarbon rubs against fluorocarbon). Several people have asked how the bead head pheasant tail and partridge soft-hackle is tied so I thought I would put together my first "step by step". This fly is not a direct imitation but rather an impressionistic fly that can represent a number of insects including olives and small stoneflies. I first saw this fly in NH at a shop on the Upper Connecticut River a few years ago. This fly can be fished on the dead drift or swung but is especially deadly when swung with a "twitch". I really like using this fly as a dropper off a large dry such as the Ausable Bomber. I tied this fly in both #16 and #18, in both brown and black. Next tie in 3-4 pheasant tail fibers with a couple wraps of thread with one wrap under the fibers to splay them out and prop them up slightly, tie in small copper ultrawire on the underside of the hook and wrap the thread back to where the pheasant tail fibers are tied in and then forward to the wire wraps. Wrap the pheasant tail fibers clockwise around the hook forward to form the body of the fly leaving a small gap for the thorax, tie off, and then counter-wrap the copper wire (4 turns) to reinforce the body. Tie in two peacock herls behind the bead and wrap back to the end of the pheasant tail body. I then take the two herls and the thread and pinch it in hackle pliers and spin them in a clockwise direction to form a tight rope. This reinforces the peacock herls and forms a nice tight rope for forming the thorax. Wrap the peacock herl rope 3-4 turns up tight against the bead. Next choose a small partridge feather with such that the fibers are about the length of the fly. You will need to choose a feather from the upper neck of the bird. Tie the feather in by the tip. There are several ways to tie in partridge for soft hackle flies but with feathers this size the only practical way to wind them in when the feather is tied in by the tip. Bind down the tip tightly with two secure wraps and snipe the tip off with your scissors. Take your hackle pliers and grasp the stem of the feather and wrap the partridge once around the hook in front of the thread. Then wrap the thread over the wound partridge and give firm tug downward. This will tighten the partridge and pull the feather completely around the shank of the hook. Use one more snug wrap over the partridge to secure it then wrap the thread over and in front the partridge, stroke the partridge fibers back and add a couple wraps to secure the partridge and then whip finish. The fly should look sparse but there should be fibers all around the shank. Another variation of this fly that I like especially in winter and early spring with small black stoneflies are around uses pheasant tail fibers that have been died black with a gun metal bead. For hackle either black hen hackle can be used or dark India hen (as shown) for a more mottled hackle. I also tie the fly without the bead on a #18 dry fly hook for when fish are taking emergers in the surface film.